Theodore Pizanis and his wife Reshma have returned to Fairfield. 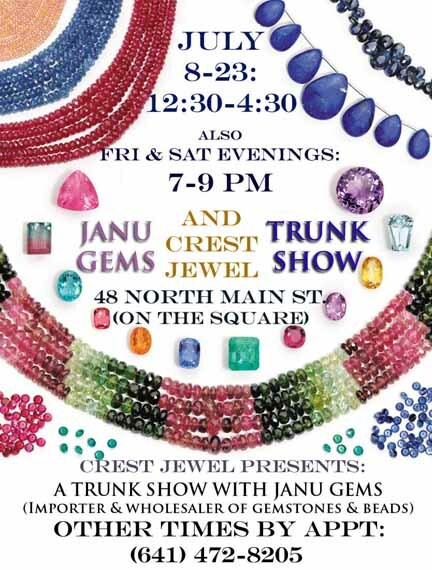 His company Janu Gems is offering wholesale priced gemstone beads and stones at the Crest Jewel Store now through the 23rd. In addition at Dalby Hall Sunday evening July 15 Reshma will perform a Gandharva Ved Sitar concert beginning at 8 PM. Reshma and Theodore will be traveling the 17th - 21st for another concert but will return to finish out the show from the 22nd - 23rd. Beads and gems will continue at Crest Jewel now - 23rd every day 9:30-4:30 PM and every evening except the 15th. Crest Jewel is located at: 48 North Main Street, Fairfield, in the center of the block opposite the gazebo. 641-472-8205 - Special Appointments are Possible. Please let people know about both these events.